Classic card games have a particular allure. There’s a steady comfort with multiple games with the same cards, and games usually keep the rules pretty simple and straightforward. This is the formula that keeps them played again and again. Crafting a game with a similar feel can be a challenge. Add in a magical theme and it could make for an accessible game with a fun twist. Players in Cast the Ritual are wizards who have discovered a secret formula and are racing against each other to get the ingredients together. Designer Cliff Stornel is the creative force behind this endeavor. Cast the Ritual is a hand management card game for 2-4 players that takes about 30 minutes to play. It plays best with 3 players. 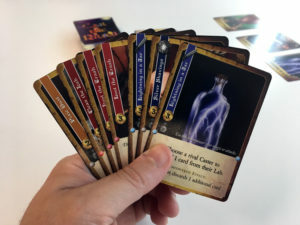 As rival wizards, players will be managing a set of cards in their Lab (their hand of cards) that will hopefully contain ingredients needed to power the ritual. Each round of the game is one ritual and three rituals will complete a game. Players who complete a ritual first will get the most points for the round. 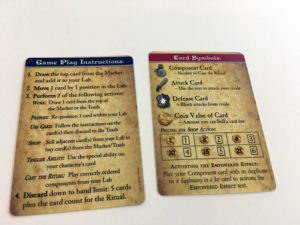 The reference cards explain game icons and steps clearly. As is often the case, just having the things is not enough. Players will also need to order cards in their hand so that the correct ingredients are placed in the correct order. 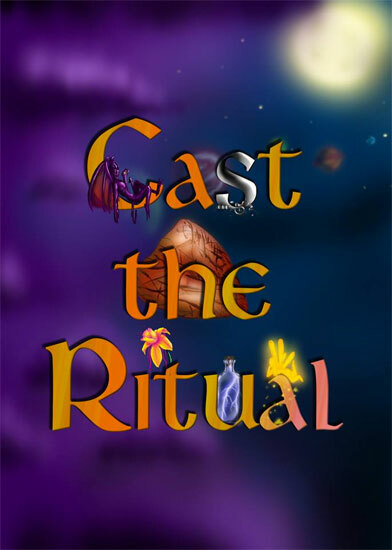 Cast the Ritual uses a game mechanism whereby the order of cards in a player’s hand matters. New cards added go to the right or left of the splay. 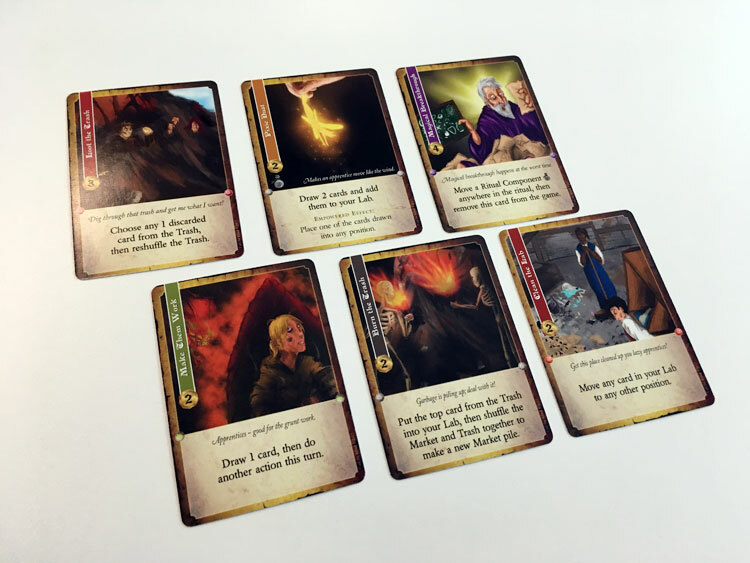 Players will use actions to manipulate the order of these cards. Prepare: Move a card one place. Play a card: Use a card’s effect. These come in a variety such as forcing an opponent to discard, drawing cards, or stealing cards. Cast the Ritual: Play cards from hand that complete the ritual. 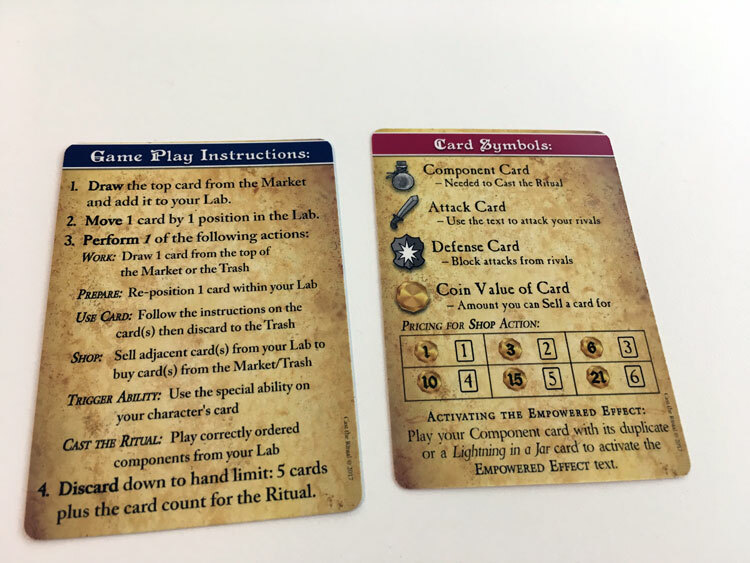 The ritual cards are a set of 3-5 ingredients that are laid out in the play area at the beginning of the round. The first player to play these cards in the order they are shown will successfully Cast the Ritual. Other players are given one more turn to try and do the same. Here’s a sampling of the game cards and the associated abilities. Almost all of them help manipulate or help build cards in hand. Although it may not seem like it from the above, Cast the Ritual has the feeling of a gamer’s version of the classic card game Gin. The hand manipulation challenge is interesting and keeping certain cards out of your opponent’s hand is important. As players hold cards in hand, it’s important to keep them in their order. The other aspect of the game are the individual character powers which, even though they are predictable variations, provide a nice twist from game to game. There’s usually a focus of strategy when you play one character versus another. The game also provides a decent and not overwhelming number of card effects. Each ingredient has an associated spell power. This piques the mental calculation on whether or not to use a valuable ingredient for the card effect or keep it for the ritual. These can also be powered up by playing two of the same card for even more options. If there is one thing to improve, it’s the card art. Low budget games often feature low budget art, and the art here is really low budget. It’s possible this was just due to a prototype copy so the pending Kickstarter might be able to mend that. Cast the Ritual is a good casual game. It’s easy to explain and provides some challenge. 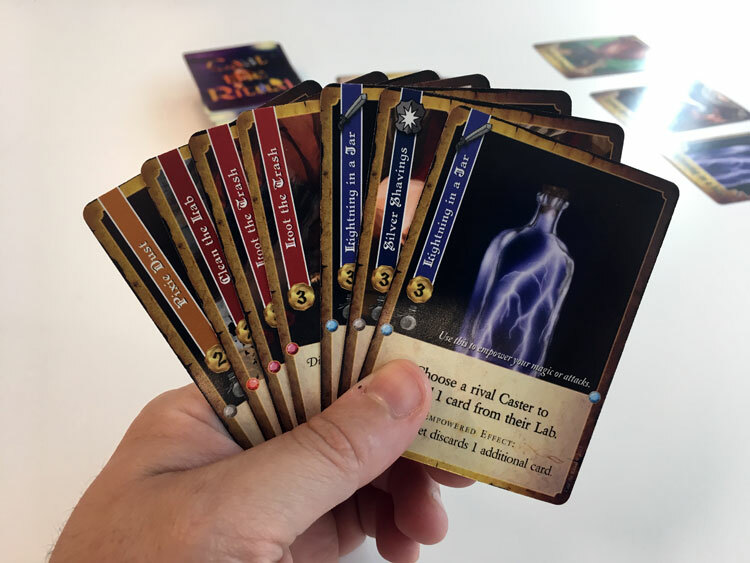 For those who like introducing non-gamer family to card games or need extra fillers for game night, Cast the Ritual could be just the right formula.